The exact moment at which a 550 million year-old cell began to divide has been captured in an exquisite 3D image. The picture is one of a series taken by researchers in 2006 while they were examining ancient fossil embryos from Guizhou Province, China. At the time the specimens, described in the journal Science, were the oldest known examples of fossil embryos, and they served to shed light on the early evolution of complex life. 'We have been able to tease apart every structure, geological or biological,' said Professor Phil Donoghue of the University of Bristol in the UK and one of the team who worked on the 162 pristine specimens. The tiny fossils were part of the Doushantuo Formation in Southern China, a limestone bed deposited between 635 and 551 million years ago which contains layers that are composed almost entirely of fossil embryos. The team behind the research believed that the fossils were the developing offspring of extremely primitive sponge-like creatures. To resolve the delicate internal structures, the scientists used a technique known as microfocus x-ray computed tomography (microCT). 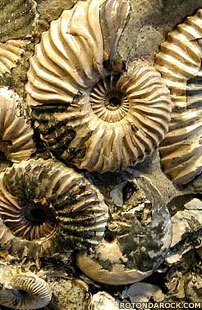 The method allowed the team to construct 3D images of the tiny fossils. Computer software was then used to analyse individual cells. 'We digitally extracted each cell from the embryos and then looked inside the cells,' said Shuhai Xiao of Virginia Tech University in the US. 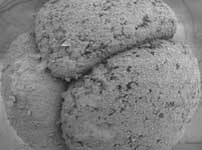 Inside, the team found kidney-shaped structures which they believed could be nuclei or other subcellular components. 'It is amazing that such delicate biological structures can be preserved in such an ancient deposit,' said Professor Xiao. In some four-celled embryos, each cell had two of the kidney-shaped structures, suggesting that they were caught in the process of splitting prior to cell division. Although the bed was packed full of the tiny fossils, the team were unable, at least initially, to find any adult specimens. Previous research suggested that the embryos were the product of complex animals, the ancestors of modern organisms. If true, this would suggest that complex multi-cellular life got started much earlier than previously thought, prior to the Cambrian explosion 542 million years ago. At this time, fossils record a dramatic change in animal diversity with many of today's modern groups suddenly making an appearance. At the time of writing, some researchers believed that the Cambrian explosion marked the emergence of modern animal life. Although complex animals had started evolving before 542 million years ago, their development accelerated at this point. Others maintained that complex animals lived long before this event and that the period just marks a time of exceptional fossil preservation. The period prior to this is the Ediacaran, which itself begins at the end of the last ice age of the 'Snowball Earth', or Cryogenian period, a term given to a series of glaciations that covered most of the planet between 850-630 or 600 million years ago. 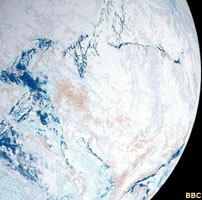 Most of the sun's (solar) radiation would have been reflected back to space by the planet's icy surface. The Doushantuo formation is important because it offers a window into this period leading up to the Cambrian and this new analysis went some way towards resolving the dispute. Using the microCT technique to analyse late stage embryos, with up to a thousand cells, the team was able to gain insights into the creature that produced them. Although the cells showed some modern traits they crucially lacked others. 'Even in these late-stage embryos there was no evidence of the formation of a tissue layer, according to Dr Donoghue. If right, this means that the Cambrian explosion theory for the origin of complex animal life would still stand. 'This work provides a constraint on when advanced groups evolved,' Dr Donoghue concluded.